Your Business Can Join The Movement to Reduce Plastic on The Planet and Promote Your Brand! Our mission is to reduce plastic, and help our clients do the same while promoting their brands. We believe reusable promotional products serve a twofold purpose: they are effective marketing tools and they are good for the planet. Over the last 20 plus years, a lot of businesses have joined with us in the reusable movement to reduce plastic, help secure loyalty from their customers, and do right by the planet. How can the reusable movement benefit your business? Consumers have a lot of choices, and a lot of expectations. There are most likely other businesses out there offering the same products or services as you, or at least other businesses willing to offer the same products or services, so it is important to make your brand stand out. Corporate social responsibility is quickly gaining momentum and consumers like to work with businesses that are doing some good. The fact that you get to support a cause and do some good is clearly a worthwhile endeavor, and makes a difference. Even if the cause is not something your consumers would personally support on their own, they will be more likely to work with your business based on your support of a cause. Environmental causes are easy for people to support, and just about everyone can get behind an environmental cause. From recycling to utilizing alternative forms of energy there are a lot of things people do every day to help the planet. 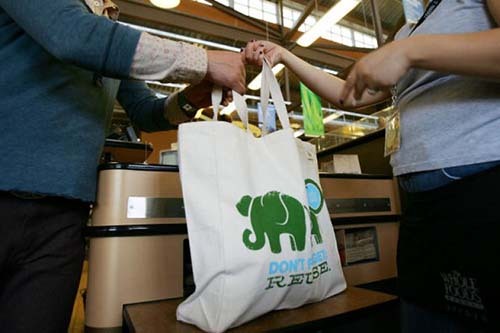 When your business takes up an eco issue and resolves to help the cause, you are making it easy for consumers to choose to work with you when they are shopping around. What Makes Reusable Products Green? Reusable marketing tools help the planet simply by being reusable. A promotional product designed and intended to be used repeatedly, reduces the need and use of plastic, single-use products, which can clog the waste stream and are likely to end up as litter. At Factory Direct Promos we take things a step further and our reusable marketing tools are made using sustainable or recycled materials to further help the planet. Our sustainable materials are fabrics made using natural fibers, like cotton, jute and even bamboo. During the growing process plants are good for the planet because they convert CO2, a greenhouse gas, into breathable oxygen. After they are harvested, processed into custom reusable bags or other marketing tools these items can safely be recycled into new items, or if they end up in a landfill they will safely break down, or biodegrade. By comparison, recycled materials are made using items that have already served a purpose and ended up being recycled. The materials are given new life, and once they have done their job promoting your brand they can be recycled, and the process starts all over again. You can join with us to make a difference in reducing plastic. Consumers want to do business with brands that care about the planet, and it’s easy to make a difference when you utilize eco-friendly marketing items. Check out our product lineup, build your own customized reusable bag, or get in touch if you have questions or would like a quote. We’re here to help you join the reusable movement! Previous Previous post: What Is The Problem with Paper Bags? Next Next post: Create Custom Shopping Bags for Marketing or Retail Use at a Reduced Price!